What is National Women’s Health Week? Visit a health care professional to receive regular checkups andpreventive screenings. Why celebrate National Women’s Health Week? We all have a role to play in women’s health. Women often serve as caregivers for their families, putting the needs of their spouses, partners, children, and parents before their own. As a result, women’s health and well-being becomes secondary. As a community, we have a responsibility to support the important women we know and do everything we can to help them take steps for longer, healthier, and happier lives. Women can easily take charge of their health, thanks to the Affordable Care Act, a landmark health care reform law enacted in 2010. This law gives Americans greater choice and better control over their own health care and includes changes that are especially meaningful to women and their families. For instance, new plans cover vital preventive services, including mammograms, colon cancer screenings, and well-woman visits with no out-of-pocket costs. It also ensures women can see an OB-GYN without a referral. To learn more about the law and your health insurance options, visit HealthCare.gov. When is National Women’s Health Week? 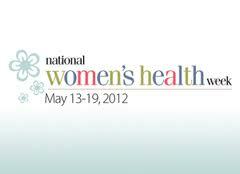 The 13th annual National Women’s Health Week kicks off on Mother’s Day, May 13, 2012 and is celebrated until May 19, 2012. National Women’s Checkup Day is Monday, May 14, 2012.